What is Virtual Reality Sickness and How to Deal With It? New Solution Found. Are you susceptible to motion sickness, such as air sickness or sea sickness? Many of us are, but a new kind of sickness is making its way literally into our homes, and it’s called virtual reality sickness or cybersickness. What is it, how can we deal with it, and can this new product from a startup company help us fight it? 2016 is being called the Year of Virtual Reality, but the reality is that it is causing a lot of problems for users. Virtual reality sickness is that nauseous feeling you get when you’re viewing VR content. Our brains are essentially being told that our body is in motion when it’s not. So, it gets confused and disoriented, causing the nausea. So how do we deal with it? Believe me, Dramamine is not the solution you’re looking for. Though it’s been used for years to treat motion sickness, it is not a practical answer for virtual reality sickness. So basically, using dramamine indiscriminately could make you create a virtual reality world of your own – not ideal! How is Virtual Reality Sickness Caused? What’s their Solution for Virtual Reality Sickness? As a result, Whitinghill and his team of students experimented with several ideas, and finally settled on one that they tested – a virtual nose called nasum virtualis. What is Nasum Virtualis? It basically acts as a reference point when you’re inside the VR experience. Incidentally, having a fixed reference point does reduce the motion sickness that you experience even in the physical world. The team got the idea from animals. Most predatory animals have their noses or snouts or beaks in front of them – visible. 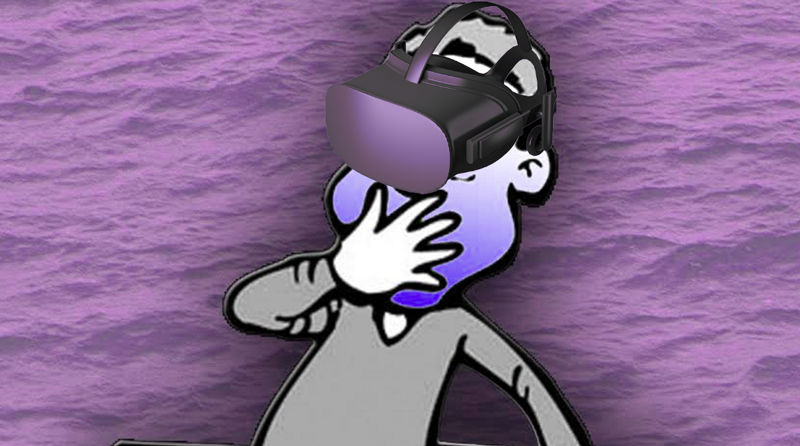 By adapting this concept, Whittinghill’s team successfully showed that introducing a “virtual nose” into the VR experience can greatly reduce the chance of VR sickness. The virtual reality nose is now patented through the Purdue Office of Technology Commercialization and currently available for license, and the company itself is called Virtualis LLC. Whittinghill hopes that VR headset makes will start adopting the new technology so more people can enjoy the VR experience without having to worry about VR sickness. But this isn’t the only solution they’re creating. They’re currently pursuing even more options to fight VR sickness because they realize that this solution may not work for everyone. The company is currently seeking additional funding for ongoing research and expanding their team so they can move faster and come up with more virtual reality sickness solutions like the Nasum Virtualis. There are also several other solutions from other companies for VR sickness, such as vMocion, which uses the Mayo Clinic’s Galvanic Vestibular Stimulation (GVS) technology to trick the brain into syncing its vestibular and visual systems. In addition, FreeFlyVR has a list of things you can do to reduce virtual reality sickness or cybersickness.